This is a reduced version of Sir Christopher Wren's plan for rebuilding London after the Great Fire which destroyed seven-eighths of the city. The two panoramic views of London, before and after the fire, are based on views by Wenceslaus Hollar. Wren was a Professor of Astronomy at Oxford with interest in the science of architecture, he was among the first to submit a proposal after the catastrophe. The narrow streets that had helped spread the fires have been replaced by monumental avenues radiating from piazzas. 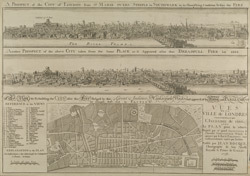 The classical buildings and formal street plans that Wren had studied in Paris and Rome are a clear influence. He also proposed constructing a Thameside quay from Bridewell to the Tower, replacing the ramshackle wooden wharf-side buildings with warehouses. Wren's plan was never used.